One of the first places we show signs of aging is around our eyes. Wrinkles, fine lines, crows feet, sagging skin, uneven skin tone, droopy eyelids and dark circles are what many of us are experiencing and trying to hold back. The skin around our eyes is fragile and needs to be treated delicately. Using harsh products can accelerate the aging process and do more harm than good. But all is not lost. There are genuine skincare products that are made from quality ingredients that will nourish, hydrate and replenish the delicate skin around our eyes. Ajara creates skin care products based on real ayurvedic principles and dosha specific. They only use the most natural and ethically grown potent but gentle herbs ingredients in all of their products. The result is effective products for lovelier skin. 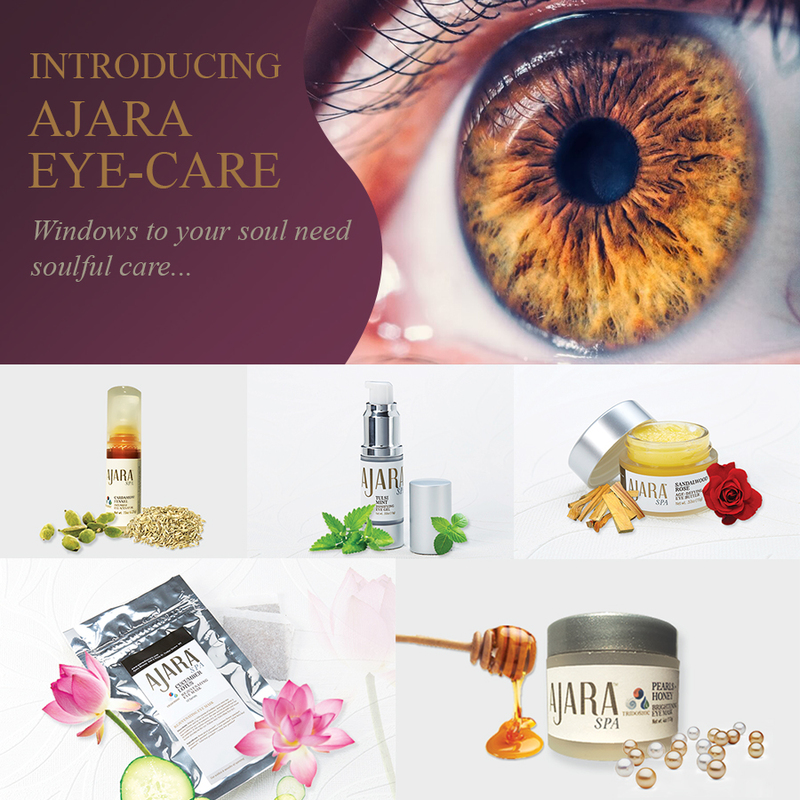 Ajara has created a four-step, five-piece set focused on the health of the skin around our eyes. Enter the Complete Eye Care Ritual Set. The Ajara Complete Eye Care Kit is intelligently designed to nourish, tone and replenish the skin around your eyes. The kit includes five effective products that will make your skin shine with a youthful glow. It’s a self-care ritual of love for your eyes. Cucumber Lotus Rejuvenating Eye Mask/Soak The Cucumber eye mask looks just like tea bags that you presoak in hot water, let cool and apply over your eyes for a rejuvenating 10 minutes. You’ll experience a relaxing soak to melt away stress with a combination of cucumber and lotus. Pearl and Honey Brightening Powder Mask This mask uses a fortified duo of the Pearl and Money Brightening Powder and the Fennel Cardamon Intensive Eye Activator which uplifts and brightens the eyes. Made from highly concentrated skin-friendly ingredients that enhance the complexion and the appearance of smooth and soft skin. Just mix the two products together as per instructions, leave on for 10 minutes and follow with the Tulsi Mint Tonifying Gel. This cooling gel will soothe your eyes while adding moisture and decreasing dark circles and saggy skin. It just takes one drop around the entire eye morning and evening. The final step of this nourishing ritual using the vibrant power of a potent potion. Made with pure organic ghee and fragrant essential oils, this eye butter will rejuvenation your eyes, reduce puffy eyes and large pores, balance skin tone and tone sagging skin.